In high school, I was an above-average student. I wasn’t at the tippy-top of the class, but I did manage to graduate 18th out of 238 students, even though I only enrolled in half of the honors and Advanced Placement courses that my peers took. While I wouldn’t advocate this route for my own children, I like to call the method “Working smarter, not harder”! After taking trigonometry/probability/statistics class my junior year (and seeing the extreme curve the teacher graded the class on due to the fact that the trig part was near impossible for most of us — both juniors and seniors — to grasp), I was wary when I enrolled in pre-calculus for my senior year. After getting a few quiz and test scores that looked more like winter temperatures (32? 43? 38? ), I’d had enough. Since the school year had only begun a few weeks prior, I was still within the window of being able to change classes. The catch was that I needed permission not only from my parents, but also from my guidance counselor. That’s where the problem began. I’d already decided which math course I wanted to take instead of pre-calculus going in to my scheduled appointment with the counselor, Mrs. X. It was a class called “Math of Finance.” The name is pretty self-explanatory, but it wasn’t considered a high math, nor was it an honors or an AP course. Mrs. X’s response to my choice? “Why would you want to be in a class with THOSE kids?” Apparently, I was heading into a different social and academic class. Oh, boy. But many of “those kids” were friends of mine. I finally got my way, although I’ll admit that my main reason for ditching pre-calculus was so that colleges didn’t see a big, fat D or an F (letters I’ve never seen on a report card before). Math of Finance turned out to be the most helpful class I’ve ever taken. I learned how to do my taxe and invest in stocks, and was introduced to the magic of compound interest. And how could you not like a teacher whose catchphrase was “Start early, and do it often” (regarding investing, of course)? It had just the right effect on us high school seniors: it screamed of sexual promise and it was something we’d remember for life. Well, at least, I did. Because of both the teacher and the material, it was an interesting class, and one of the few high school classes that really stuck with me all these years. By showing us how much money we could save by starting at a young age and making sure it was in interest-bearing accounts, both I and “those kids” were well-prepared for real-world personal finance after graduation. We could balance our checkbooks and knew that interest could be compounded daily, monthly or yearly. Pre-calculus couldn’t have taught me that. Wow, “seeing the extreme curve the teacher graded the class on due to the fact that the trig part was near impossible…” is one huge red flag. Those students never learned trignometry! We shouldn’t be grading on a curve. We should grade on mastery of the subject. Mrs. X’s response to my choice? 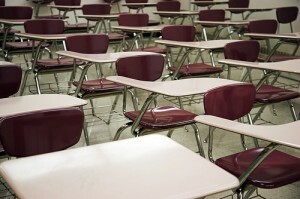 “Why would you want to be in a class with THOSE kids?” is equally as shocking. Talk about Exclusion and teaching our kids to work with different kinds of people. I hope those days are gone. Great topic. I feel that in general our education system has a huge flaw in that classes like “Math of Finance” are not mandatory for all students. I have seriously been considering starting general financial classes in the community to just see what sort of interest is out there at all levels, but have considered offering my services to a high school crowd in particular. Biggest thing holding me back is I do not have any formal credentials concerning finance (Masters in Healthcare Administration). I am considering pursuing a CFP (Certified Financial Planner) certificate so I feel I have some more legitimacy to break out into community service areas at first. What a great class! I haven’t used Calculus in the real world yet. Some basic algebra on rare occasions, but that’s about it. I wish I’d taken something like that instead of Pre-Calc. I managed to get by with a B, I think, but it was awful. Oh well. Fortunately I got a great PF class in college. It was mostly seniors trying to make sure we were prepared to face the world & I think that made it a better class since people took it seriously. It would have been great if we were allowed to choose our math class in high school, but unfortunately we didn’t. I would love to have been in a similar class like you had, and I’m sure that I would really learn a lot from it. I’ve been really interested in starting my own business when I was just a kid, I really don’t know who I got it from. But learning stocks, investment and compounded interests from a young and early stage of your life, that would have worked wonders for me. Most of my financial knowledge that I have acquired now, I’m just learning them on my own. One thing that I do know is, your teacher is right about starting out early and keeping it constant. Since math was always my worse subject, I guess it makes sense as to why I’m in such financial distress as an adult today. This certainly sounds like a much more useful class. It’s funny how something that has so much more direct impact to everyday life is not required when classes like Pre-calc are. Aye, I guess this is just the nature of the academic beast. I always aced my math classes, even trigonometry and pre-calculus. It wasn’t until my senior year in high school that I decided to “work smart, not hard.” Instead of taking all honors classes and being bombarded with hours of homework every night, I took some “normal” classes instead and couldn’t believe the difference. In the honors classes, I could earn a solid B if I paid attention, did all of the homework and reports, and studied for tests and quizzes. In the “normal” classes, I did none of the homework and put my head down most of the time, yet I knew all of the material inside and out and received an A on all of my tests while my classmates were struggling to earn a C. I wish I had made the switch several years earlier!! Sounds like this class should be mandatory! Most kids don’t learn this stuff at home and our society is suffering from our lack of everyday financial knowledge! In home-ec we were taught how to write/record checks and balance a check book. We earned fake money by doing class work and had to write checks to pay weekly “bills”. You could also pay instead of doing an assignent but there was a prize for having the most money left at the end. I avoided Calculus in high school by taking Statistics–a highly useful class! Then I arrived at university and took a placement test and they would not allow me NOT to take Calculus. I opted for Business Calculus (so as not to be in the class with all the pre-med folks). I would have so preferred to take a class on the history of mathematical concepts–how cool would that have been? Or, on the other hand, it would have been fun to learn about business math in general with application to investing. . .I mean, I knew about interest already, but something along those lines. We plodded through graphing break even points for businesses, but I just never found a real-life application for the business calculus. . .I’m not saying there isn’t one at all–there just hasn’t been one in my life. I had some statistics as part of my trigonometry/probability/statistics course the year prior, but the calculus… oy. I wish I had been offered a similar class. I don’t think this is a class that is available in many schools. How wonderful that class would be as a prerequisite to graduation! I think it definitely should be a prerequisite to graduation! Yeah, I don’t think pre-calc prepared me for fiscal responsibility. Good call! Were we in the same class, or did you take it a year ahead of me? I hated it, and didn’t like the teacher, whose name I can’t remember, because she was NOT helpful.